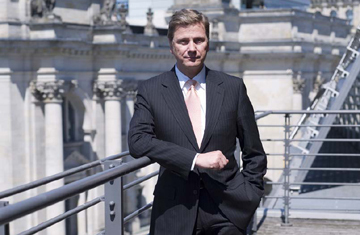 You could easily mistake Guido Westerwelle for the living embodiment of Germany's national stereotype. Square-jawed, bronzed and urbane, the 47-year-old leader of the liberal Free Democratic Party doesn't exactly radiate humor. Asked what motivates him, he answers solemnly, "I burn internally." "He lives for politics," confirms close friend Hartmut Knüppel, who has known Westerwelle since they met through a youth wing of the FDP almost three decades ago.